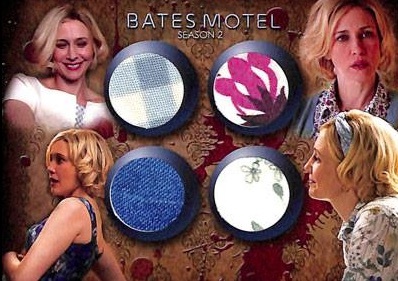 2016 Breygent Bates Motel Comic Con Special Edition is a limited release that combines elements from 2015 Bates Motel Season 1 with new options from Season 2. 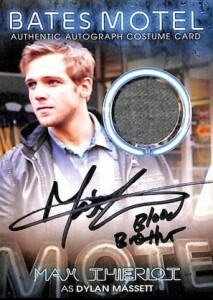 Each pack includes eight total hits. Although each card is stamped with SDCC (San Diego Comic-Con), and that was the intended venue, the packs will instead be distributed like regular Breygent products. 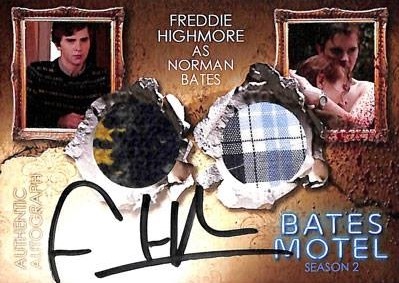 Among the options found in the packs are Autographs, Autographed Costumes (Single or Dual Relics), Costumes (Single, Triple or Quad), and Props from both Season 1 and Season 2. The designs can be easily distinguished as Season 2 is noted directly on the cards. The special edition product includes only hits and all cards are numbered to 100 or less, with as few as four copies for one card. 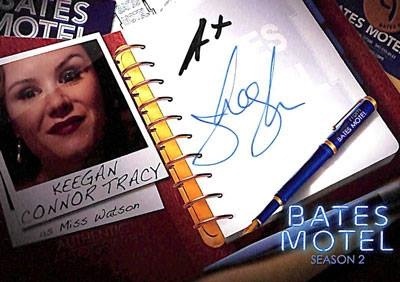 The main Autographs are not actually numbered but, per Breygent, are limited to 50 copies or less. 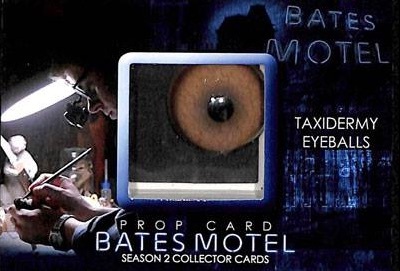 The full 2016 Breygent Bates Motel Comic Con Special Edition release is limited to 314 packs of eight cards that retail for $99 per pack. Print run for each is 50 or less. Some feature inscriptions.